Despite the wet spring we’ve started gardening and the answer to soaked soil is to build some raised flower beds. So we took advice from www.horshamdecksandpatios.co.uk and learned how to build our own beds. 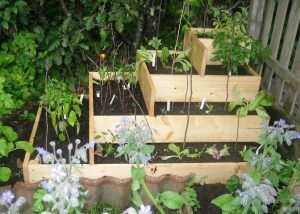 They taught us how to use old pallets and build a block of raised beds as in the photo. It’s a brilliant way to discourage pests like slugs and snails. They can still reach the plants if they’re really tenacious but it certainly cuts down the numbers you have to remove. Once built, you can fill the wooden containers with all kinds of plants. You could use it for a wonderful herb garden or for small vegetables, but I decided to plant flowers in mine. Of course you have to be careful about the size and growth rates of the plants you choose, otherwise you’ll completely hide the pots and lose the benefits of the tiered design. I’ve picked bedding plants primarily, topped off with aquilegia to give height and colour at the apex of the block. It already looks quite spectacular and I’m looking forward to seeing it in the summer in full bloom. I’m fully aware that my tiered raised bed isn’t the traditional model that you might expect to find in a garden. Normally there’s only one level and they can be built within existing beds, or more often standalone units, often surrounded by hard landscaping or gravel. I’d guess that most people who choose raised beds do so to save their knees or their backs – or maybe they’re in a wheel chair and can’t reach down to soil level. In this case raised beds are a godsend and more than just a useful device that looks good in the garden. In our last home we had several raised beds near the house. They were easy to maintain and contained a mixture of vegetables and flowers. It worked really well and they were easy to keep pest-free because we had gravel on the ground around every unit. These beds were pretty large – about 8 feet x 4 feet and provided a wonderful space to grow a variety of suitable plants. When planting these mixed beds, I always chose bright colourful flowers because most vegetables are primarily green and can look quite boring. Interplanting with beautiful flowers adds interest and really enhances the garden in my opinion. In fact they were much admired by most visitors so I think we must have got something right. I’d really recommend that everyone tries building and planting up a raised bed – or several. They make life easier as they’re better to plant out and also to maintain than regular flower beds. Give it a go – I’m sure you’ll be sold! It’s Easter Monday and I guess spring is supposed to be here. But it’s raining – again. I know we get a lot of rain in England but this is pushing the boundaries and the gardens are just sodden. My poor friends who are just brilliant tree surgeons at www.leicestertreesurgeons.co.uk are tearing their hair out. 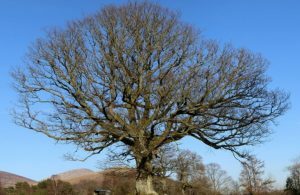 They usually get quite a few enquiries for tree pruning and even tree removal at this time of year as people decide what they want for their gardens and plan for the summer. Often they take out a tree or even transplant one to change the look of the garden. It’s surprising what a difference can be made by moving a featured plant even a few feet. But this year the phones have been virtually silent. Apart from the odd occasion when a tree has been blown down or branches snapped off in high winds, they’ve been struck by the silence! It’s such a shame because they know everyone will want work done at the same time, so they’ll probably be very busy all summer – if the rain ever stops. But that doesn’t help the dearth of work right now, when they still have to pay their team of tree surgeons but aren’t getting in any money to help. Even hedge cutting is way down this year. No-one wants machinery on their land when it’s all so wet. It’s not easy to leave ground looking good when there are ruts all over the place and holes two feet deep. I say “holes” but actually I mean small ponds because the water table is so low that they instantly fill with water. On the subject of trees, our enormous eucalyptus has been shedding a lot of leaves. We’re not sure whether this is normal at this time of year but I don’t remember it ever happening before. Perhaps it has something to do with being waterlogged – I just hope it’s not dying, not least because it would cost a fortune to remove! We discovered recently that they have quite shallow roots so aren’t really stable when they get to a great height – and ours would qualify for that -eek. On the positive side, now the snow has gone there do seem to be a lot of spring flowers around. Right now daffodils are out and primroses are putting on a very good show. We’ve got a lot of camelias blooming – probably the best ever with their pale pink rose-like blooms. They are just beautiful. And the rhododendrons are full of buds so hopefully will put on a good show in a couple of months. Bluebells are coming through, though they’re not yet in bloom, but again I think we’ll have a very good year. Perhaps these spring flowers like a nice wet winter – but we humans don’t. As I write, the birdbath is full and the driveway is full of puddles, as is the area below the bird feeding station. The horses are kept in today because they’re just as fed up with all the water and mud, but it has turned milder, so the grass is going to come through with a vengeance when the rain finally stops. It’s a funny time of year for us. It’s not yet spring, Christmas is well gone (just credit card bills to pay), St Valentine’s day is around the corner, and we’ve been doing some early spring cleaning. That has involved cleaning windows, moving all the furniture, dusting, polishing, washing walls and not least calling in a professional carpet cleaning company. It’s lovely to have a fresh-smelling house but outside everything is still looking a bit grim. When the sun shines I realise how tatty everything is looking. I’ve been a bit lazy and neglected to empty all the pots from last summer. So many of them sport dying, sad-looking plants that will never revive. But a few contain hardy plants and shrubs like roses and fuschias that should bounce back in the spring. I’ve seen a few snow drops and I’m sure daffodils are beginning to appear, although the only ones I’ve seen are the pot I have on my window sill and the vase on the kitchen table! But within the next few weeks a few more spring plants will start to show, including beautiful crocus and primroses. These spring flowers are so delicate in lovely shades of mauves and yellows. I always pick a small bunch of primroses to place in a blue and white vase on the dresser. They last quite a while and cheer the room. Vulnerable plants still need protecting from frost and snow should be knocked off shrubs and plants to avoid broken branches. It’s also getting to the time of year when overgrown shrubs and hedges can be trimmed into shape. So there’s still plenty to do in the garden, even though we may be reluctant to brave the cold! It’s been a beautiful day today, despite the cold winds, and I’ve noticed a lot of grass sprouting in the gravel driveway. It’s surprising how this is taking over this year and I fear I’ll need to spray with weedkiller before long. It needs a dry spell, of course, to avoid the chemicals being washed away by rain. Much as I hate to apply strong chemicals in the garden, I’ve never found another way to keep the drive under control. It’s just too back-breaking to pick out every blade of grass by hand – we have a long drive! The one thing that bothers me is our lovely spring bank. It’s usually covered in primroses, then the bluebells take over with the odd daffodil scattered around. And amongst the native flowers are a couple of spectacular camelias, followed in June by a large purple rhododendron. But at the end of last summer we had a fence erected all along our boundary, inside the hedge. That involved a lot of bank trampling, which I fear has killed some of those spring flowers that have been arriving without fail every year since we moved here in the 1980’s. So it’s with bated breath that I await the spring to see how many have survived. I’ll be devastated if they primroses don’t appear, though I’ve more faith that many of the bluebells will be ok, given that their bulbs are quite a way underground. Only time will tell and I’ll be back to let you know how we fare. It’s been a strange sort of summer – although that’s not unusual in England. We started off with a lot of rain and then quite cold spells, interspersed with the odd nice day. But since mid-August it’s turned really hot. And it’s very humid too, so it’s a bit draining. We’ve had some Worthing Builders in to do some work for us and they’ve put in a lovely wall, a paved area and a beautiful garden room. That’s something I’ve always wanted so we’re really pleased with it all. I’ll post photos when I have a bit more time. Meanwhile the flowers in the garden are looking lovely. They’re mostly in pots, though, so that takes a huge amount of watering at this time of year. I’ve got into a routine of going around in the late evening but before it gets dark – and haven’t the nights started to draw in? It’s horrible to see it getting dark by just after 9 and I suppose in another week or two it’ll be 8.30. Anyhow, back to my routine. We have two outside taps so I have to do two lots of watering so the hose reaches everything. It takes about half an hour in total, but it’s nice out there once it’s got a little cooler. Then I feed everything about once a week at the moment. It’s a bit arduous with the watering can, but it keeps all the flowers looking reasonable. I use Miracle Grow, which does what it says on the tin! I don’t dead-head very much though – except the geraniums which have such large heads. The petunias have to fend for themselves – life’s too short to spend hours taking off all the dead blooms. From the bedroom window it all looks wonderful on the patio below – I’ll certainly have to post those pictures. I just noticed this morning that the horse chestnut trees are already turning brown. I suppose it’s because we’ve had so little rain recently, even though it poured and poured earlier in the summer. I’m guessing they’ll start to lose their leaves in the next few weeks, which seems awfully earlier. I don’t like this early reminder of autumn when summer has only just begun! The eucalyptus seems to still be shooting up, though it’s difficult to tell how much it grows when it’s so tall. I do know that it sheds bark on a regular basis and it’s a chore to have to remove it all on a frequent basis. But it rewards us with a magnificent site, towering now above the oak trees. And it’s only around 30 years old, which doesn’t seem long in tree years. The apple trees have been laden with fruit, although much from the first tree is still laying on the ground. The apples provide food for much of the wildlife, including thrushes, jackdaws (who knock the fruit from the tree), squirrels (who pick the fruit) and deer. Not to mention the wasps who appear to get drunk. But there don’t appear to be as many wasps around this year, thank goodness. Last year they were everywhere and someone got stung at one of our barbecues. This year we’ve seen a few but not high numbers. It’s probably because we had a few nests removed in 2015. I don’t like to do that but when they’re eating your house to build their nests and getting aggressive, there’s not much choice, other than to lock yourself indoors and wait for the house to fall down. I exaggerate of course but I don’t think most people have a love of wasps. 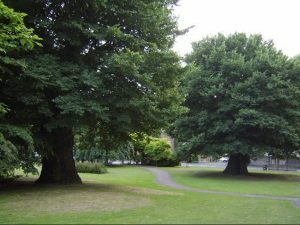 Sadly we have lost a huge number of mature elm trees over the last 60 years as Dutch Elm disease has struck England. These are such beautiful trees and like the oak, one can only use the word “majestic”! The elm is a deciduous tree, native to Southern and Eastern Europe and is one of the fastest-growing and largest of our trees. There’s nothing more majestic than an English Oak tree and I have a wonderful specimen in my own Horsham garden. 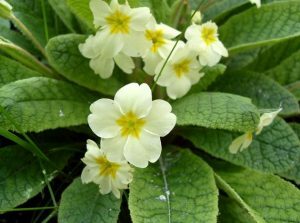 Another harbinger of spring, appearing slightly before bluebells, is the pale yellow and beatiful primula vulgaris – the English primrose. 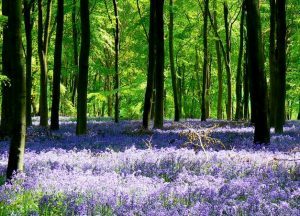 It’s a flower that spreads year on year, tumbling down banks and scattered through light woodland and across verges throughout the countryside. 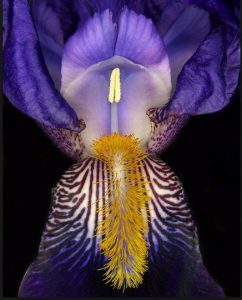 In Chailey, East Sussex, there is a farm that specialises in bearded irises. And what wonderful beauties they are. This photo demonstrates how the bearded lily gets its name, with it’s hairy appearance. May brings some wonderful shows of irises, not least at the National Trust property at Wakehurst Place, where we love to admire the beautiful lily garden. 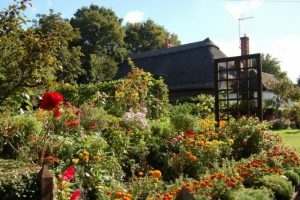 A visit to any National Trust garden isn’t complete, of course, without having tea or lunch. Although they’re not quite up to the standard of years ago when everything was home-made, you can still get a nice snack at all the gardens I’ve visited. Well it rained yesterday and even tried to snow, so I didn’t get out to take some photos of the bluebells as hoped. It’s been unseasonably cold this month, although it’s a bit warmer today now the sun is out. So I thought I’d write about one of our most loved wild flowers that arrive so reliably each spring. I’m Sally Furnival and I always wanted to be a florist. It’s a bit late now though because I’m in my (ahem) 70’s so I’m not about to start a new career anytime soon.